Over the last few years the market has become pretty saturated with face oils to the extent that I—the self-proclaimed face oil queen—find myself casually shrugging off many new releases. When you’ve sampled dozens and dozens and you feel intimately familiar with each of the botanical ingredients commonly found in face oils, it can take some cajoling to give up those that you’ve grown to love (barbary fig! rose hip!) in order to try a new one. Could it possibly offer a different experience with better or comparable results? 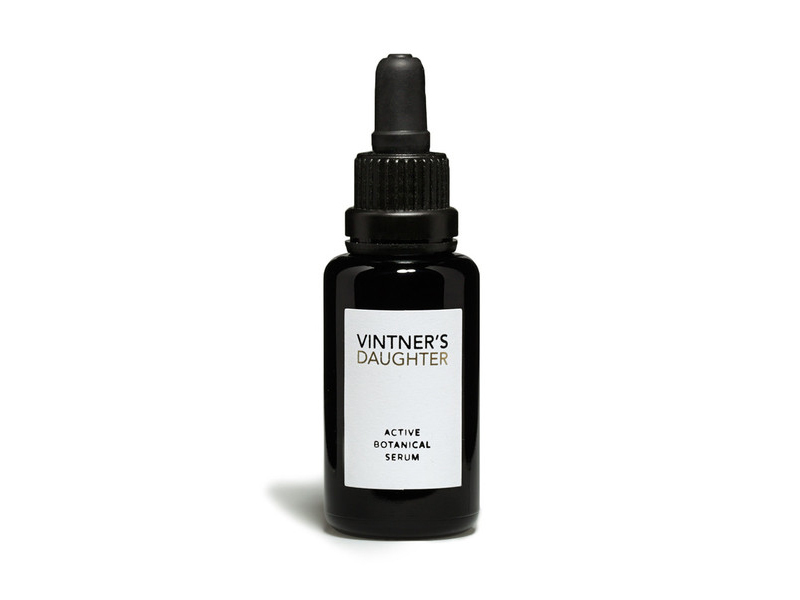 In the case of Vintner’s Daughter Active Botanical Serum, yes it can. For my skin, this serum performs better than the majority of face oils I’ve tried and has become a fast favorite alongside a handful of tried and true face oils. It’s beautiful, luxurious and it noticeably improves the health and appearance of skin. This serum first caught my eye on Into the Gloss with the attention-grabbing headline “The Face Oil to End All Face Oils”. I filed it away in my memory bank of face oils until I heard from Terri and Marc that Integrity Botanicals was launching Vintner’s Daughter. Once I received my bottle for testing purposes, I eagerly cracked open the bottle to do a quick sniff and swatch test. The delicate scent of jasmine, citrus, frankincense and rose hooked into my senses. That and the velvet finish where I’d placed it on the back of my hand were enough to get me to drop all other products that evening and put the Active Botanical Serum to the test. Like others before me, I awoke to find an even and calm complexion after one night alone with this beauty. I was fresh-faced and in love. This is the kind of serum that layers beautifully with other products or protects and nourishes skin all on its own. It’s hard to tell at this point whether it will be enough on its own during the winter, but the Active Botanical Serum currently provides my skin with everything it needs morning and night. Let’s face it, when you wake up in the morning, take a look in the mirror and feel compelled to skip makeup before trotting out to brunch with friends, your serum is doing its job. The Active Botanical Serum is a multi-correctional formula that offers a small particle size so the active botanicals can deeply penetrate skin’s layers to protect and repair. The formula combines 22 active botanical ingredients that include anti-inflammatory phytonutrients, skin firming phytoceramides, nourishing fatty-acids and powerful anti-oxidants. In combination, these botanicals help fight signs of aging, stimulate cellular turnover, maintain skin elasticity, strengthen capillaries, inhibit melanin production, prevent wrinkles, deliver oxygen to cells and protect against free-radical damage. Quite the list of benefits, right? Vintner’s Daughter left nothing to be desired, and I can’t wait for you to try it for yourself. April Garguilo, the woman who founded Vintner’s Daughter, comes to skincare from the wine industry in Napa where she ran her family’s vineyard for about ten years. This experience helped shape the Active Botanical Serum, since Garguilo is intimately familiar with how ingredient quality and processing practices make or break your product. You can think of the Active Botanical Serum as a really fine wine made with love and integrity. It benefits your skin health and is a true pleasure to indulge in. Vintner’s Daughter launches this week at Integrity Botanicals, so check back with us on Thursday for an exclusive interview with the founder and a giveaway. So excited to try this! Sounds like it could be a HG product for me! Very excited for this giveaway , would love to win this , love all things organic and natural , the skin is our largest organ , it absorbs everything you put on it !! Intriguing. I know you test a ton of products so a glowing review makes one take notice. This sounds like an amazing product , would love to give this a try .